Celebrate our Beautiful Planet with Picture Books About Nature and the Earth! Earth Day is around the corner! On April 22, 2018, boys and girls, young and old, will come together worldwide with one common goal: celebrating our magnificent planet. In anticipation of the big day, kids from America to Australia will spend time educating themselves about Earth Day and reading fabulous, vibrant picture books about our beautiful planet. What is the Earth? How do we care for it? And why should we bother? Good news - this post has got you covered. Here are some of our favorite picture books about nature and the Earth - both fiction and nonfiction alike. Happy reading! 10 Picture Books About Nature and Protecting the Earth! Kate, Who Tamed the Wind, by Liz Garton Scanlon and illustrated by Lee White: I absolutely adore this brand new book, which is a fantastic earth day read-aloud! When a wild wind blows on the tippy-top of a steep hill, everything goes wild for the man who lives there. Kate takes it upon herself to help him tame the wind - with trees, no less. With themes of both friendship and the importance of trees in our world, this is a total winner. The EARTH Book, by Todd Parr: With its die-cut Earth on the cover, this is a fabulous book for your littlest readers all about our planet. From environmental protection and conservation to actual tips on how children can care for the planet, this one is a guaranteed winner! Simple, yet so powerful and accessible. Snowboy and the Last Tree Standing, by Hiawyn Oram and illustrated by Brigitta Sif: Snowboy is busy playing games when Greenbackboy approaches him to play a new, even better one: all they have to do is cut down all the trees and catch all the fish and they can trade these riches in for the real stuff: gold. But we all know that greed can be destructive. This is a fabulous new book conveying the importance of conserving natural resources, a perfect conversation starter to get kids thinking about how they, too, can save the earth. Here We Are: Notes for Living on Planet Earth, by Oliver Jeffers: In his latest book, Jeffers seeks to answer all of those bewildering questions a new arrival to our planet may have- questions about space and sea, people and animals. It conveys a simple message - be kind to our planet, and be kind to each other. A beauty! Trash Revolution: Breaking the Waste Cycle, by Erica Fyvie and illustrated by Bill Slavin: This is an excellent choice to get kids thinking about the ways in which they can reduce, reuse and recycle. Full of fascinating facts depicted in infographics, short sections, charts and sidebars, this book takes real facts and makes them accessible and fun. This is a phenomenal resource for all classrooms. The Curious Garden, by Peter Brown: This is a quietly beautiful story about a boy in a dreary town who discovers a straggling garden while out on a walk one day. He decides to care for it, nurturing it with love and patience and perseverance, even after it is harmed by the elements. Once he nurtures the garden, it grows and grows, bringing life to the city and blue to the skies. This book is stunning both in story and illustration, with themes of perseverance, environmental activism, and community improvement. The Lorax, by Dr. Seuss: "Unless someone like you...cares a whole awful lot...nothing is going to get better...It's not." Dr. Seuss tackled the topic of conserving the earth's natural beauty in his famous story, The Lorax, a perfect and fun read in preparation for Earth Day. Though written in the 1970s, The Lorax never lost relevance, as its ecological warning is still critically important today. Earth! My First 4.54 Billion Years, by Stacy McAnulty and illustrated by David Litchfield: We adore this book, a fun read from Earth's point of view, all about, you guessed it, "planet awesome"! Young readers will learn about critical moments in Earth's history, from her birth to the present day. In addition to the fun facts woven throughout the story, the book includes fantastic back matter with an additional host of factual tidbits for the most curious readers. 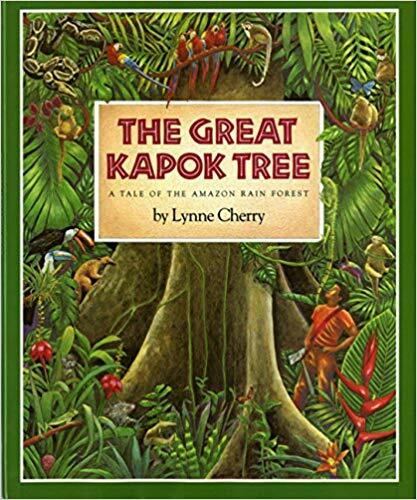 The Great Kapok Tree: A Tale of the Amazon Rainforest, by Lynne Cherry: One day in the Amazon, a man tires quickly after trying unsuccessfully to chop down a giant Kapok tree. He lays down to nap, and as he sleeps, all of the forest's animals - and even a young boy from the Yanomamo tribe - whisper to him about the importance of the trees to their own survival, the impact they have on the natural world, and how all living things depend on one another. This is a beauty, both in terms of illustration and text. See Inside Planet Earth, by Katie Daynes and Peter Allen: A fabulously informative lift the flap book for "big kids," teaching them not only about our planet, but the effects global warming and climate change have on the Earth. While this one can certainly be read to lower grades, it is better suited for older kids. See Inside Planet Earth will have upper elementary students learning not just about our awesome planet, but how to save it too! Hope you give these books two trunks up! DID YOU LIKE THESE PICTURE BOOKS ABOUT NATURE AND THE EARTH? WE THINK YOU WILL LIKE THESE, TOO!